And, once you have taken in Nicholas’ sage insights, follow this link to see some thoughts from another Londoner. The World Gold Council’s Director of Corporate Communications, John Mulligan, assesses Brexit’s impact on gold going forward. Last Thursday evening was a night to remember in the United Kingdom. Voters who favored leaving the European Union (EU) had canceled their victory party by the close of polls at 10:00 PM. Later in the evening, the leader of the U.K. Independence Party, Nigel Farage, had conceded that Brexit had lost 52% to 48%. 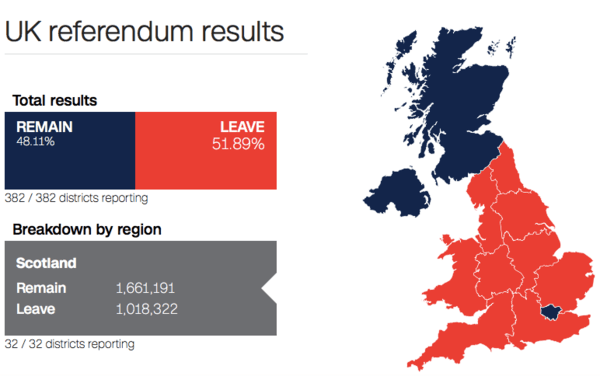 The “Remain” campaign supporters across the country went to bed at 11:00 PM secure in the knowledge they would awake to a United Kingdom that had voted to remain in the EU. The financial markets’ verdict was clear. Global stock markets lost more than $2.1 trillion in market cap in the largest single day drop since at least 2007. The amount lost was equal to over 70% of the United Kingdom’s GDP. Across the Pond, U.S. stocks alone lost over $830 billion. The financial pundits, betting houses and hedge funds, who had hired their own private exit pollsters, were caught off guard as almost everyone – including myself - had predicted that the Britain’s vote to exit the EU would fail. It is, of course, difficult to assess the lasting impact of Brexit after a single trading day and a weekend. Nevertheless, here are nine preliminary takeaways from Thursday’s shock vote. With London voting 60:40 in favor of remaining in the EU, the disconnect between a cosmopolitan London and a far more British rest of the U.K. was larger than we thought. A map of how various areas of the U.K. voted is revealing. London is a small island of pro-EU sentiment in a sea of blue. That’s because London had the most financial skin in the game. Brexit is already depressing prime London real estate prices. The number of workers in the City of London- the United Kingdom’s answer to Wall Street - 360,000 today - is already tumbling with Morgan Stanley moving 2,000 staff to Dublin and Frankfurt. Other banks - both American and European - are expected to follow. I see two reasons the polls leading up to the Brexit vote were spectacularly wrong, underestimating the level of pro-Brexit sentiment in most of England. First, to be pro-European Union is to be sophisticated, educated and international. You are part of the global elite. As it turned out, these London-based elites - much like New York City or Washington, D.C. - were out of touch and lived in their own echo chamber of a distorted reality. Second, in the mind of the elites, Brexit was the nationalistic, politically incorrect, even racist choice. And as such, Brexiters were reluctant to admit which side of the referendum they supported. But they lost that reluctance once they cast an anonymous vote at the ballot box. Scotland – which voted for the remain camp 62:38 and is being dragged out of the EU against its will - is already contemplating a re-run of its referendum in Scottish independence, two years after the Scotts voted to remain in the U.K. A quixotic petition for London to secede has already gathered 168,000 signatures. There are rumblings in Northern Ireland – which supported the Remain camp 56:44 - that there should be a vote to reunite with Ireland. A recent poll suggested that Sweden would support leaving the EU if there was Brexit. French and Dutch rightwing politicians are already calling for their own referendums to exit the European Union. The vote on Brexit is a real world test case of what Thomas Sowell has called the “Conflict of Visions.” It is the conflict between “bottom-up” and “top-down” government. It is the contrast between self-determination and central planning. In U.S. political terms, it is a state’s right to determine its own economic and political fate versus the federal government running its affairs through an onslaught of regulatory decrees and executive orders. Much to the consternation of Europe’s political and media elites, the Brits outside of London mustered enough political heft to help self-determination to prevail. When I spoke on Brexit on a Texas radio station last week, my hosts told me Texans often joke about seceding from the United States. Sure enough, I saw several articles discussing the possibility of a “Texit” –Texas exiting the United States - following the successful Brexit vote. Prior to the vote, the British people were warned that Brexit would mean economic Armageddon. They clearly ignored those warnings. The issue that really hit home was immigration. First, the EU’s free movement of labor has altered the very fabric of the United Kingdom, through the arrival of millions of Eastern European immigrants. The arrival of iconic “Polish plumbers” changed the character of previously quintessentially British cities into something barely recognizable to their original English inhabitants. Second, the issue of EU immigration was conflated with the highly visible impact of Britain’s surging Muslim population. The most common boy’s name in the U.K. is Muhammed (or some version of it). London’s newly elected Muslim Mayor, Sadiq Kahn, has now banned women in bathing suits on London billboards under the politically correct guise of “body shaming.” Parts of central London today feel more like Cairo than the United Kingdom. Brexit wanted “Britain to be Britain” - however politically incorrect that position was in the mainstream media. 6) Brexit Has Clear Implications for the U.S. Presidential Elections. Donald Trump was in Scotland for the Brexit vote, and in typical Trump style, he took credit for predicting it. The unexpected strength of pro Brexit voters - which amounted to about an eight-point swing in favor of Brexit compared to the final polls - is a warning shot across the bow for the Hillary Clinton campaign. That’s because there is a big overlap in the demographic, psychological, and economic profile of pro-Brexit voters and Trump supporters. The blue collar workers of Sunderland in the United Kingdom have much more in common with former steel workers in Pittsburgh, than they do with the elites occupying the U.K. Prime Minister’s office at Number 10 Downing Street, or the White House on Pennsylvania Avenue. The U.S. equivalent of Brexit supporters are the disenfranchised factory workers of Michigan, Ohio and Pennsylvania. Catchy slogans that “The world is flat” notwithstanding, globalization upended the lives of this traditional democratic base. Their concerns were ignored by a political elite for whom transgender bathroom rights were more important than the collapse of wide swathes of the U.S. industrial heartland. The financial markets’ sharp reaction to Brexit on Friday brought economic uncertainty into sharp relief. But the more excruciatingly complex issues are related to regulation. By rejecting the straightjacket of EU regulations, the UK is entering the no man’s land black hole of onerous negotiations. That puts the power in the hands of the very lawyers and bureaucrats the Brexit voters rebelled against. Still, it falls upon these foot soldiers of modern commerce to work out Britain’s new legal and regulatory regime outside the EU. The range of issues is breathtaking - and goes far beyond immigration quotas. It spans everything from foreign policy decisions like new Russian sanctions and a revamped corporate tax code, to laws on data protection - as well as hundreds of additional areas. A simple list of these areas would go longer than this article. The Remain camp’s primary argument for staying in the EU was to avoid economic uncertainty. A vote for Brexit would push Britain into recession, taking thousands of pounds out of every British family’s pockets. As the outcome of the Brexit vote itself confirms, economic predictions should be taken with a grain of salt. Economic commentator John Mauldin recently pointed out that out of the Fed’s last 100 predictions, not a single one has come to pass. That’s a record so bad, it’s almost statistically impossible. We do know Britain alone accounts for just 3.9% of the world’s output. By any objective measure, a recession in the UK won’t be big enough to take the global economy down. As economist Larry Summers pointed out, much of the negative of Brexit in the global economy will be due to psychology. What follows is probably the most unfashionable of takeaways from Brexit. Among all the doom and gloom of conventional thinking, there is an upside to Brexit. And it goes back to the benefits of self-determination. After Brexit, the United Kingdom will be free to set its own path. Britain’s tax system can be made more attractive to foreign investors, as it is freed from the shackles of EU constraints. In an iconoclastic tweet, Netscape founder and Silicon Valley venture capitalist, Marc Andreessen, has already suggested that Britain could become a much more attractive place for U.S. tech investors after Brexit. Finally, Britain will be able to better control the inflow of immigrants and allow it to better shape the character of its own society and its own values. And, at its heart, that is what the Brexit vote was all about.